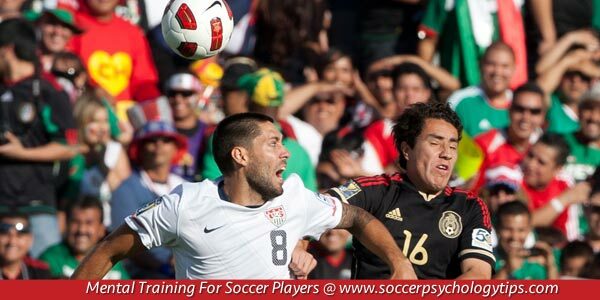 Performing under pressure is a quality of great soccer players. 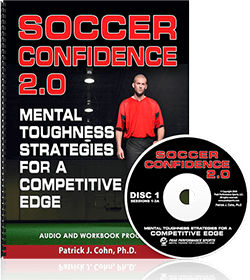 Particularly as you move to a higher level in soccer, the ability to compete under pressure will become more and more important. Under pressure, soccer players’ intensity and physiological activation increases, which causes their heart rate, breathing and other physical signs to increase. This state can be very positive as it can help you focus better in crunch time. 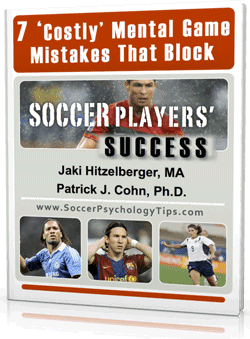 For many players though, it can cause them to tighten up, make bad passes, or miss goal-scoring opportunities. One of your objectives when you feel the pressure to perform well is to interpret your anxiety and tension, such as pregame jitters as positive. Tell yourself that you are just pumped up and focused. 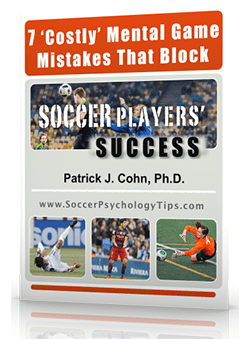 Welcome these pregame nerves as a natural part of soccer. Focusing too much on the tension you feel from being under pressure only heightens anxiety, causes you to over think, and ultimately under perform. When you feel nervous, do not bring more attention to the knot in your stomach or a rapid heartbeat. Accept that your body is just getting ready to perform your best in competition. The key is to handle your pregame nerves rather than allowing it to handle you! Pressure can cause you to doubt or question your ability, if you let it. Whether you think positively or negatively about being in high-pressure situations will determine if you will react well or poorly to it. Players who choke are afraid of the feelings that come with pressure, whereas athletes who are successful, embrace the feelings that come with pressure. Pressure is only bad if you see it as harmful, but it can actually help you perform better if you use it to your advantage. Some soccer players prefer to use or channel the feeling of being under pressure into their performance, to gain energy, feel prepared, and help them reach greater heights – whereas others find that they perform much better if they can manage to disregard the pressure, and remain as relaxed and loose as possible. For instance, if you perform better in pressure situations, then thinking about the game or practice in advance to build up some pre-competition nervousness may actually provide some additional fuel (in the way of nervous energy) for you to channel into the game! Alternatively, some soccer players play much better when in a relaxed state. If you are one of these players, you want to distract yourself from thinking too much about the game in advance (e.g. by talking to friends, listening to music, reading a book etc). You can also use relaxation methods such as taking time to focus on your breathing and visualizing a positive performance before the game to help you to get into The Zone. Figure out what works best for you and develop a pregame and prepractice routine that will help you better cope with the pressure you experience. In part two of this article, we’ll focus on how to create a positive self-image of yourself as an athlete who thrives under pressure.